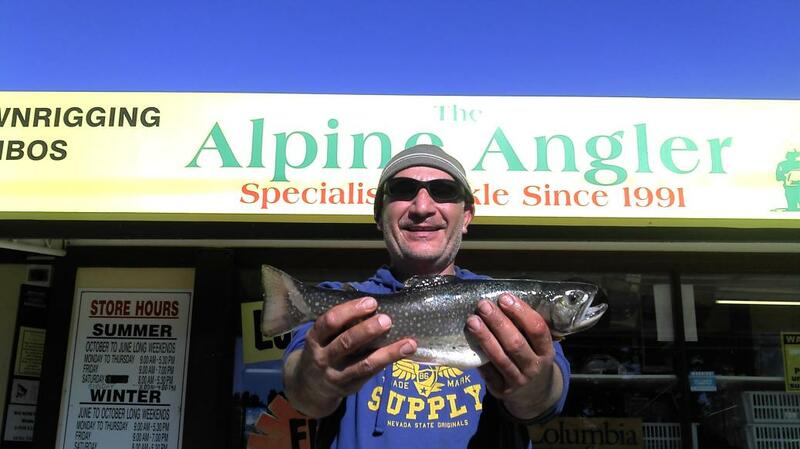 Lake Jindabyne:- Jindabyne reports have picked up over on the west side Olive woollie buggers have been the best. Conditions for polaroiding has been great. On the weekend the brown have been on the move so pick your days start early you will have better results. Try Hayshed Bay, Sid’s, Waste point and Kalkite. Fishing around jindy has Improved walking around the Banks have been good many fish have been in Close so walk slow and keep an eye out the days are getting better and the fishing is Improving. Lake Eucumbene:- You will have better results if you pick a good feeding line and move the fly slow yes the lake is coming up. Fly reports have improved with some nice rainbows about for those willing to search. There are also more and more browns getting back from spawning and searching the edges for food. Hi guys! 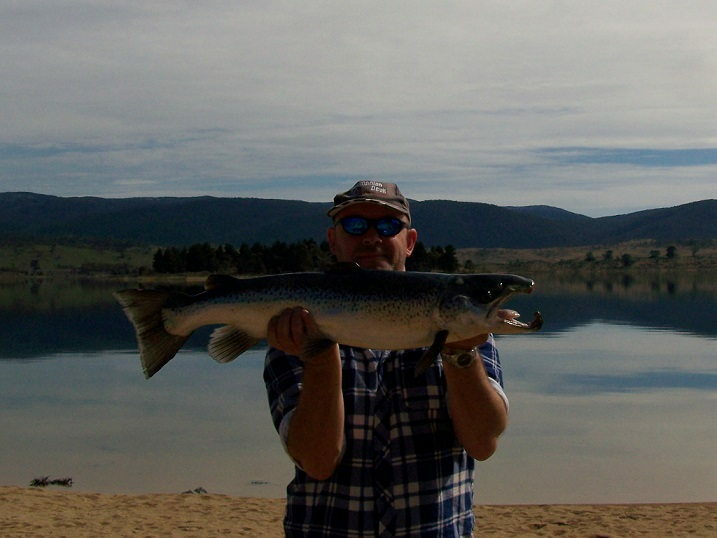 Managed to land a nice Alantic Salmon on Tuesday moring at Jindabyne. Taken whilst trolling the deep water near East Jindabyne island on 3c using as YW Fredo Frog tassie. Followed it up the next day with a 57cm, 4lb Alantic ....again using the same lure on the leadline. All in all a nics couple of days trolling in the sunshine!!! TROLLING JINDABYNE & EUCUMBENE.. Not much has Change around jiny with Trolling but with the warmer weather coming things will get better. Jindabyne has produced few reports this week there are still some good fish to be Caught in Jindabyne but early starts are the key to catching them big brown especially when the weather is super calm. Some nice fish taken trolling around the outside of the weed beds in many of the bays. Blade lures and Tassie lures are doing well on the big browns as will the Rapala X-Raps. 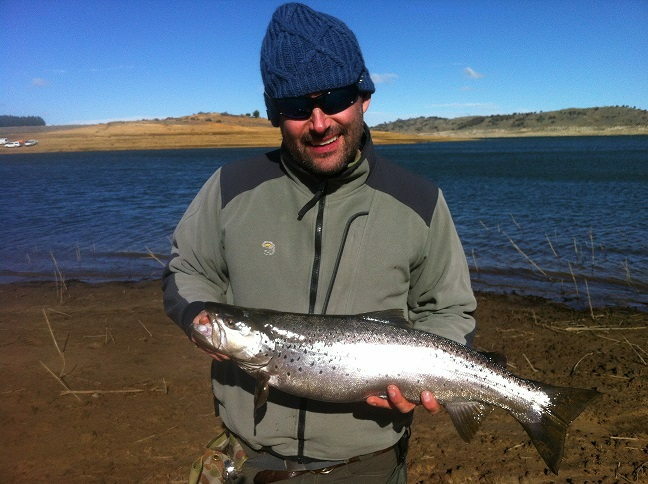 Still good reports of good fish have caught around the Snowy arm and Kalkite. Reports off trolling close to the banks has been really good. Hi we were fishing at Buckenderra for the weekend got a 43cm Rainbow and dropped a massive brown at the boat on a Tassie funky frog at clover Point. 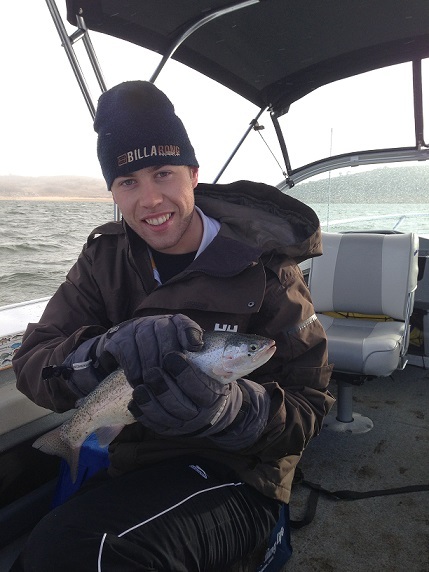 Eucumbene:- Things are getting better around Buckenderra with some good brown and rainbows on Tassie devils. Eucumbene reports have been varied with some good fish being taken by those who put in the time. Trolling and drifting and casting lures around the river mouth would be the best methods at the moment Don't forget the rivers are closed so don't go to close.